I’ve been working today on a drawing of those houses at the south end of Creed Street opposite the Church and the former Science and Art Institute. I should be able to finish it tomorrow. The company built five cottages here, probably in late 1841. Four of them appear to have been shops from the outset. They were numbered from 612 to 616 and were likely the last houses to be built in this phase of Wolverton’s development. The corner building, detached from the rest of the terrace, was a bakery and I imagine it was purpose-built as such. It was much larger than the Bury Street bakery built a few years earlier. For most of the 19th century it was operated by the Walker family. John Walker and his father William were the first occupants and after the bakery in Bury Street was pulled down may have been the only commercial bakers in the town for a few years until the new bakery opened on the corner of Radcliffe Street and Church Street in the 1860s. I assume that many housewives still baked their own bread but a trend for commercially produced bread would have grown throughout the 19th century. As the town expanded a new bakery started at the corner of Church Street and Radcliffe Street (now demolished) and a later one at the start of Church Street, known as the “Brighton Bakery”. The coop also built a large bakery on Aylesbury street at the back of its premises on the Market Square. But for a time John Walker’s family met the demand. After the Bury Street shops were demolished in 1857, the Co-op bakery moved. John Walker soldiered on until 1892 when he died at the advanced age of 84. Thereafter it was taken over by Hannah Smith, a 40 year-old widow, who employed a baker but ran the shop as a more generalized grocery. The next four units were separated by a back lane. William Lacey, ran a butcher’s shop. He was 42 at the time of the 1851 Census and probably established in his trade. He came from Bedfordshire. After his relatively early death before 1861 his widow, Lucy, carried on the trade for a while and then was succeeded by various butchers who ran this shop throughout the nineteenth century – none lasting too long. George Gilling. already described, had a shop at the south end of Bury Street, but he retired after 1857. As new lots in Church Street and Stratford Road expanded the town in the 1860s new butcher’s businesses opened in Church Street and the Stratford Road. The next unit was residential and later in the century became the house for the church sexton. At the south end of Creed Street two buildings were always counted as one. 612 and 613. One side was used as a grocery store and the other kept for residential purposes. The street appearance was that of a single story building but as the land sloped back towards Ledsam Street the buildings were in fact split level. In my boyhood the former grocer’s shop was used as a fish and chip shop, open evenings and weekends and operated by Lloyd Billingham. In the photo you can see the exposed beams for the second floor and where the staircase used to be there is also an internal door surviving between the two units. The end house was quite large according to mid-twentieth century photographs. It is my surmise that the building was extended while it was a prosperous grocery store in the nineteenth century. There were various occupants during the century: Richard and Charlotte West in 1851, James and Mary Harrison in 1861, William Culverhouse in 1871, Daniel and Sarah Russell in 1881, Herbert and Sarah Chipperfield in 1891, Daniel and Sarah Russell in 1901. James Harrison is clearly designated as Manager of the Cooperative Stores during his tenure here but he is also to be found in later censuses as a grocer on Church Street. If he was still working for the Co-op then the Co-op grocery must have moved. However, subsequent occupants are obviously managers rather than independent grocers, so the Co-op may have retained an interest until Daniel Russell , who ran the shop in 1881, returned in 1901 from his period of work in Harpenden to take over this shop as an independent grocer. I have been looking at some of the old salary registers for Wolverton in the late 1840s. Most men’s weekly age was equivalent to the cost of a daily newspaper today and if you were very well paid, such as an engine driver, yur weekly earnings would buy you a coffee at Starbucks. However these comparisons are not very meaningful other than to show how money has become inflated over a century and a half. It is more meaningful to look at the relative incomes of the time. Currency is expressed in pounds, shillings and pence. There were 20 shillings to the pound and 12 pence to the shilling. So 10 shillings would be half a pound and 6s 8d. one-third of a pound. Agricultural labourers in the 1840s could expect to earn 6s to 8s per week (and that was not always certain) so we can use this as a yardstick to measure Wolverton wages. According to the registers Engine Drivers at Wolverton were paid between 6s 8d per day to 7s 10d per day so on a six day week they could expect to earn over £2. Firemen, who did the hard work of stoking the boilers were paid between 2s 8d and 4s 2d, giving a weekly income of over £1. Porters earned a weekly wage of 19s and tipping was forbidden. Policemen (i.e. men who did the signalling and point switching) were also paid 19s and their inspectors (the men in charge) paid £1 10s. Clerical staff were much better paid. Babazon Stafford, the senior accountant earned £300 per annum and Alfred Blott, the Station Master, was paid £200 p.a. The schoolmaster, Archibald Laing, earned £100 p.a. and had a house provided. His female colleagues did less well. Emma Hassall, who taught the girls, was rewarded at £40 p.a. and Amelia Prince, the infants teacher, received a measly £30 p.a. George Weight, the vicar, had a stipend of £50 and the Vicarage, but presumably he had other means to supplement his income. All of this pales into insignificance beside Richard Creed, the Company Secretary, and Edward Bury, the Locomotive Superintendent, who were each paid a princely annual income of £1400 each. He appears to have been quite successful in what was a brand new job. He took lodgings at Old Wolverton and when the Villas were built in 1841 moved into one of them, which thereafter became the Station Masters’s house. He married in 1843 and started his family. His starting salary was £100 and by 1850 he was earning £200 a year – a big salary in those days. So all was well with the world and he may well have seen out his career at Wolverton but for the fact that he appears to have lost his head, and perhaps his heart too, to a “young lady” whose name is probably unrecorded. I discovered this tidbit of Victorian scandal yesterday while looking through some records at the National Archives in Kew. The year is 1851 and apparently Blott eloped with this young lady. Lter he seems to have repented this action and returned home to face the consequences. Wolverton was a small community and in 1851 this was a big scandal. His employers reprimanded him and decided to move him to another station. There was then an intervention by various worthies of the district to try to retain Mr Blott, who appears to be well thought of. The Board changed its mind and reinstated him at Wolverton. Then there was a further change of mind, possibly prompted by Blott himself, and he was transferred to Oxford where another Station Master had been sacked for fiddling the books. Unmentioned in any of these accounts is his wife Cornelia, but she stayed with him, so one must assume that he was forgiven, even though the adventure might not be forgotten. Blott stayed with the L&NWR for a few more years and then found a job as Deputy Bursar of an Oxford College. He died in 1868 at the comparatively young age of 50. Early public acts by the London and Birmingham Railway were the building of schools for children and the establishment of a Reading Room for adult self improvement. 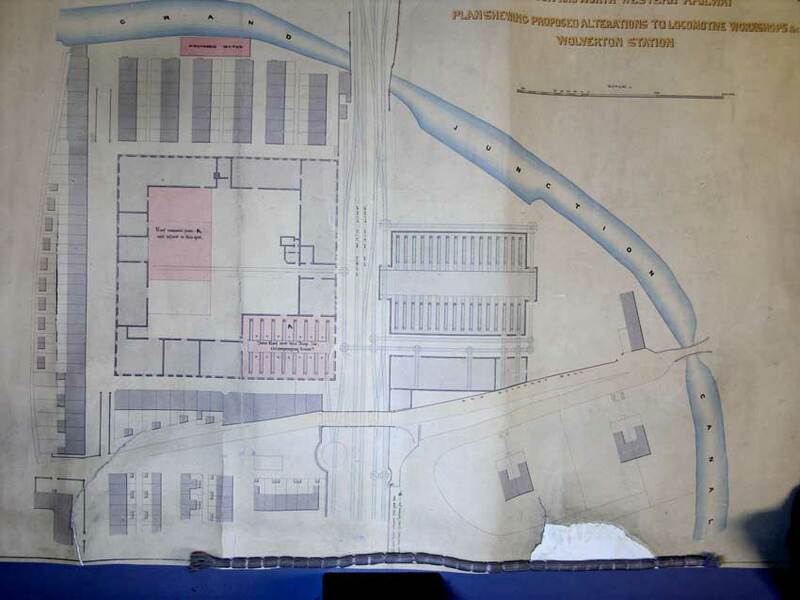 The Reading Room was built on a corner of the first tract of land beside the canal and the new road. See plan below. It is claimed by the developers of the new Wolverton Park housing development that the Reading Room has been preserved. If this is so, this is not in its original form. I have taken this photograph recently which show the view from the canal of the site of the Reading Room. It shows buildings that have been much enlarged and added to over the years since 1840. The original canal bridge must have been lower, one of the hump-backed bridges that were still common when I was young and the road had not been built up to its present level. I suggest that the road level was probably raised in 1881 when the third station was opened and it was certainly raised again in 1960 when electrification of the main line caused the railway bridge to be raised. 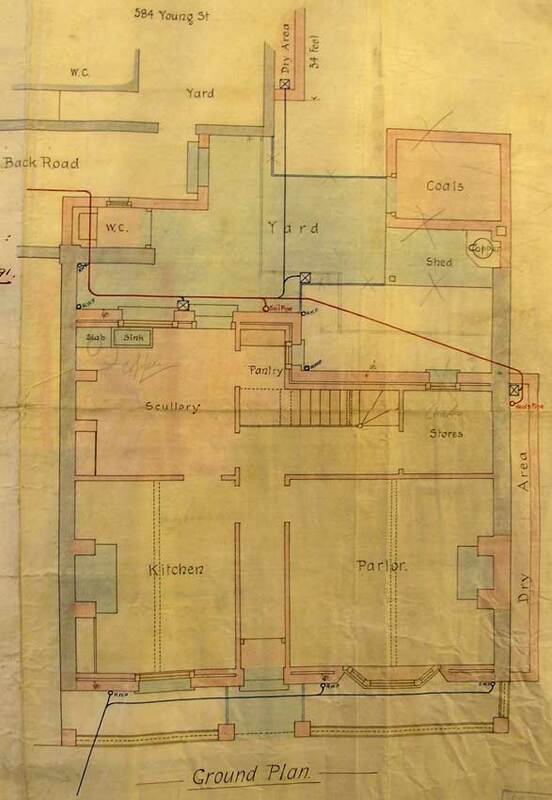 Plans for adaptation of the Reading Room as a Wesleyan Chapel in 1845 show only a single story building. It is possible that the lower part of the building seen in the photo, with the blue-painted doors was part of the original but most plans from the 1840s show it set back further from the canal. The original Reading Room became redundant when the Science and Art Institute was opened in 1864 and the Wesleyan Chapel in 1892. After that the buildings here, including the workshops, were much modified to turn them to newer useful functions. 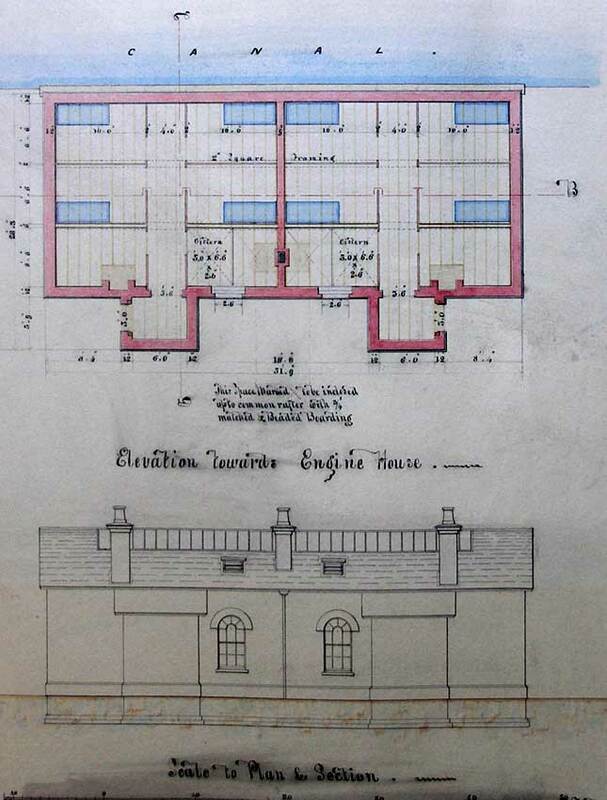 This plan, from the PRO, shows the Reading Room in its Chapel adaptation, complete with pews. Note the number and spacing of the windows on the long side, which are by no means apparent in present day pictures.